my plane, as we come in for a landing. I added the Go! 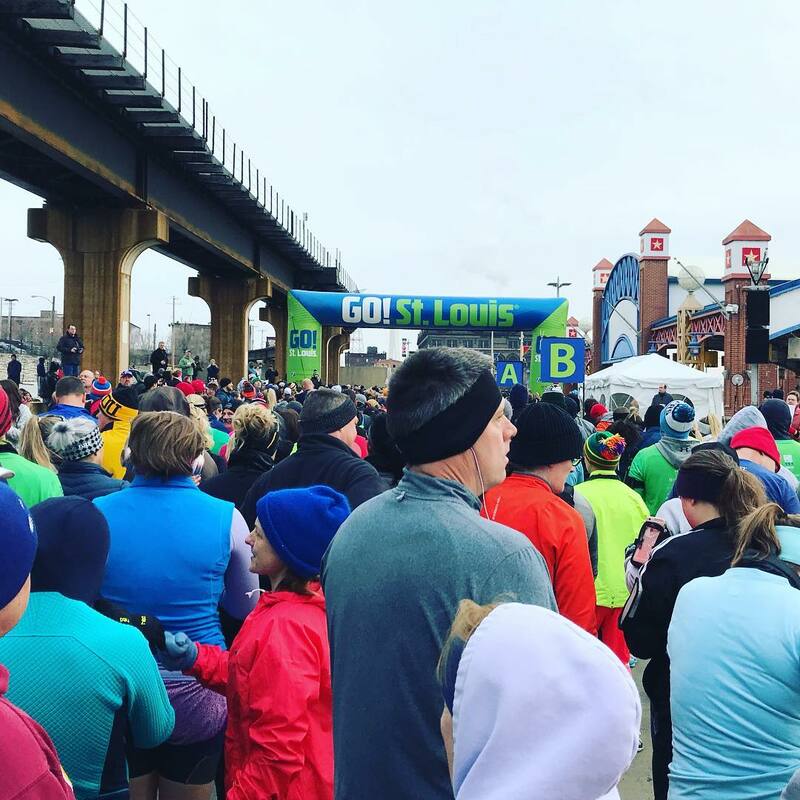 St. Louis Marathon to my 2018 calendar roughly a month before the race, making it part of my preparations for a double marathon weekend in late April between the Revel Mt. 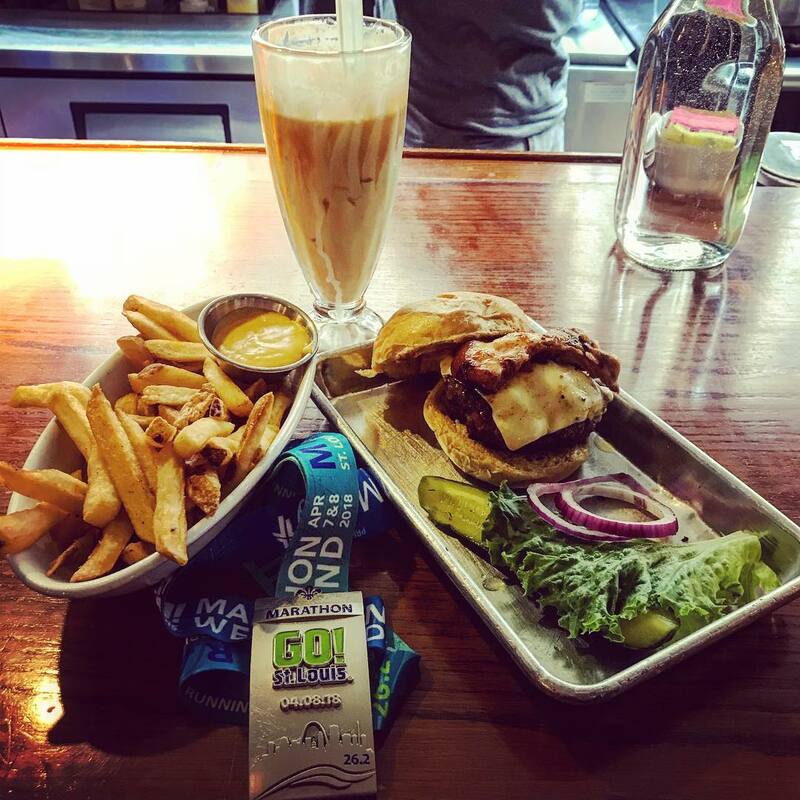 Charleston Marathon and Big Sur Marathon on consecutive days. My "training" consisted of getting myself ready to do lots of mileage over consecutive days, pulling in two "Goofys" - 39.3 mile weekends with a full and half marathon on a Saturday and Sunday - a term coined from the Disney Marathon challenge of doing both distance races a day apart. 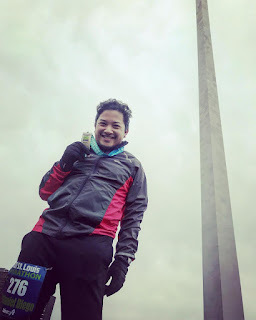 This was my second Goofy weekend before my big double, having run a half and full in Pennsylvania just two weeks earlier. 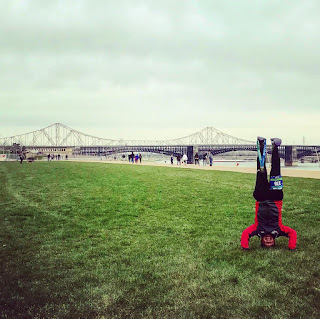 This would be my third distance race in St. Louis, having completed the Rock 'n' Roll St. Louis Half Marathon twice - in 2014 and 2016. 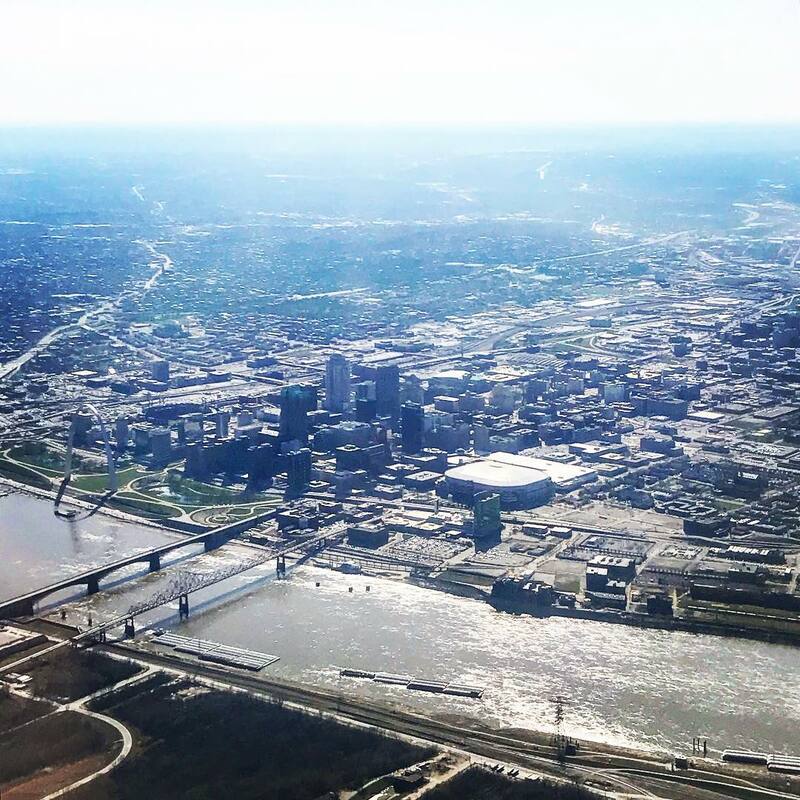 I got to St. Louis on Saturday afternoon, after a very busy morning, running a half marathon in Charlottesville, Virginia, then getting on a plane to fly to Atlanta then to St. Louis. At the St. Louis Airport, my friend Kimberly picked me up, and we dropped my bags off at her house before we headed to our friends' Eddie and Natalie's in the suburb of Chesterfield for a delicious dinner with other runner friends in town for the race. There, we met up with our friends Donna and Georgia who were also staying at Kimberly's, who had driven over from Springfield, Illinois where they ran the Lincoln Presidential Half Marathon on Saturday morning. 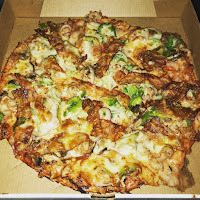 After a great time spent with friends, and a full belly from the delicious dinner at Eddie and Natalie's, we headed back to Kimberly's and had some more food before the night was over - needing to stop at Imo's Pizza, a local St. Louis favorite, famous for their St. Louis style pizza - a very thin cracker-like crust made without yeast, Provel processed cheese, and slices cut into squares or rectangles instead of wedges. We had an early morning 5:15am wake up call on Sunday, with the temperatures very cold at only 30°F. After waiting for our other friend Hollie to arrive and park her car at Kimberly's, our carpool traveled in one car toward downtown St. Louis and the parking location we were provided a pass for. We were all bundled up and with tired legs from racing the day before. 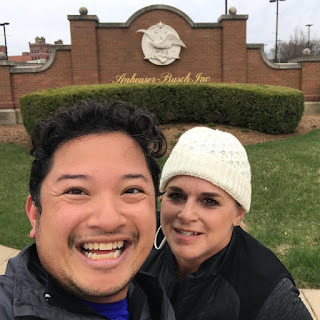 After parking, we walked down to the cobblestone streets of Laclede's Landing, already dreading the possibility that we'd have to run over these ankle twisting terrain and met up with other runners who had gone to the dinner the night before. We also found Ken and Ryan from Arkansas, who were in the corrals preparing to pace the 4:45 marathon group. 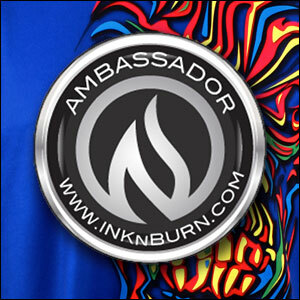 I decided to start alongside them, knowing full well my finish times in recent memory were not going to be able to keep up. After the anthem, the gun set off and being far back in the corrals we got a good vantage point of the runners as they began to run overhead on the span of the Martin Luther King Bridge into Illinois. Our start was a bit late, going off some 23 minutes after the gun, but off we went, heading up Sullivan Boulevard alongside the Mississippi River for about a tenth of a mile before taking the abrupt and slightly severe uphill along Carr and North 4th Streets to get up to the Martin Luther King Bridge. We were halfway across the bridge and technically in the state of Illinois as we hit the first mile mark, making it to the other side and arriving in the city of East St Louis, Illinois. My legs already began to ache as we made our way across the concrete. 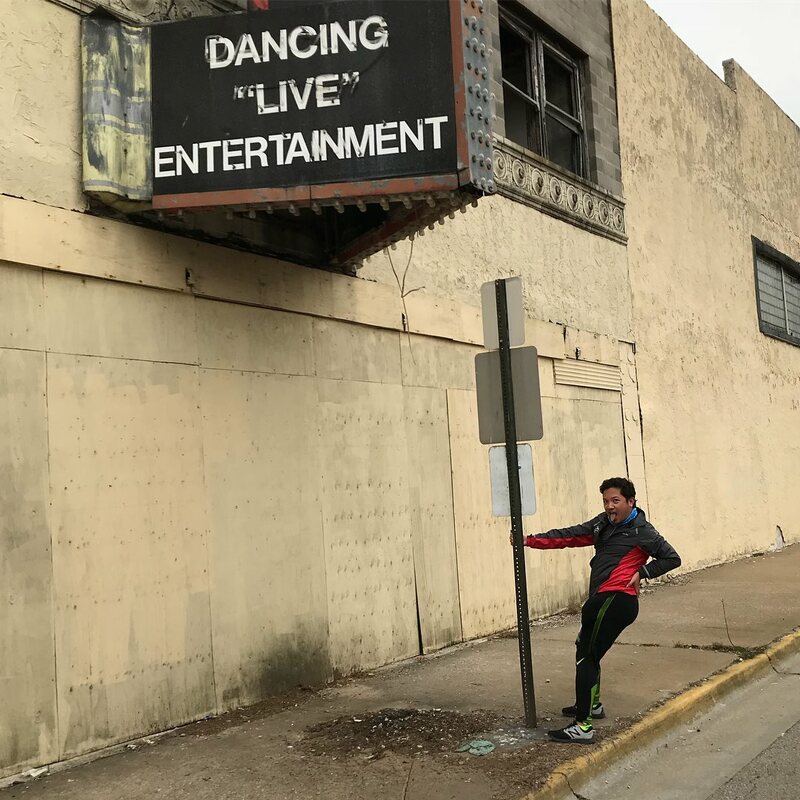 East St. Louis was once a bustling industrial center, but like many cities in the Rust Belt, it was severely affected by the loss of jobs due to industrial restructuring during the second half of the 20th century. 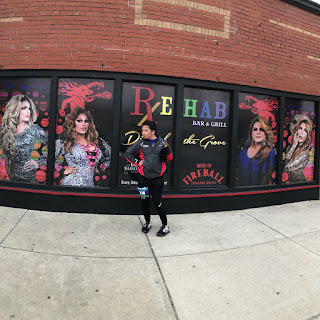 Consistent with the growing poverty and unemployment, the city maintains a seedy reputation as one of the most dangerous cities in the US. As we made our way off of the bridge's span, and then ran briefly through the city's downtown, we saw many abandoned buildings and strip clubs along Collinsville Avenue. 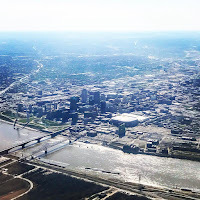 Our time here in this desolate ghost town was thankfully shortlived, spending roughly 2.5 miles on this side of the border, eventually taking River Park Drive onto the Eads Bridge as we ran back over the river toward Missouri. Leaving East St. Louis, I see the arch! The Eads Bridge was opened in 1874, the first bridge erected across the Mississippi River south of the Missouri River, and one of the oldest bridges on the river. At the time of its construction, it contained the longest rigid span and the deepest underwater constructions for its foundations. 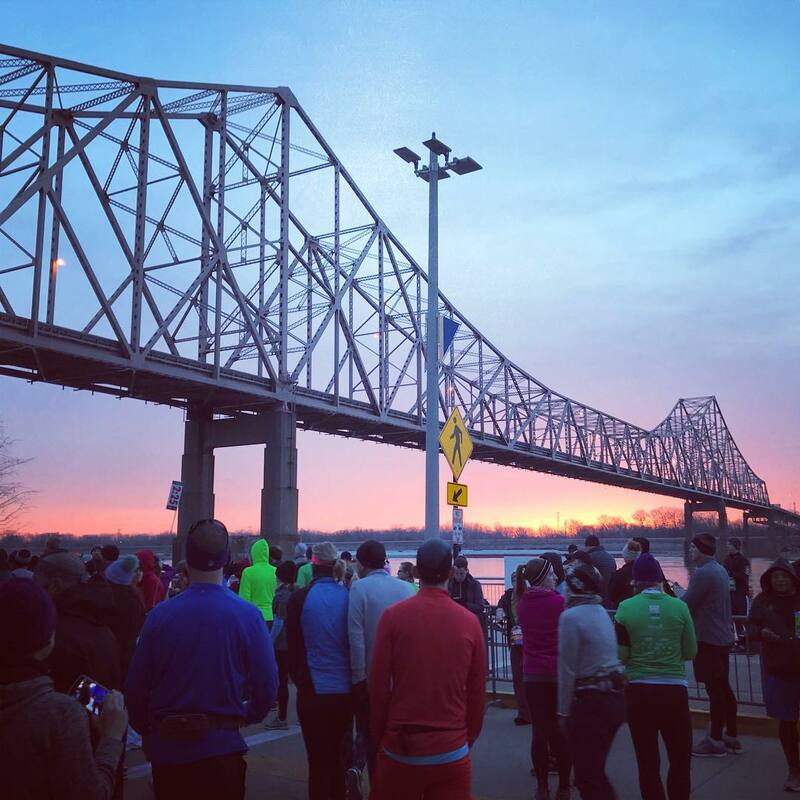 The bridge was also an iconic image of the city of St. Louis, up until 1965 when the Gateway Arch was completed. Upon crossing back into Missouri, the half marathon and marathon runners continued on down Washington Avenue, eventually turning left onto Broadway. 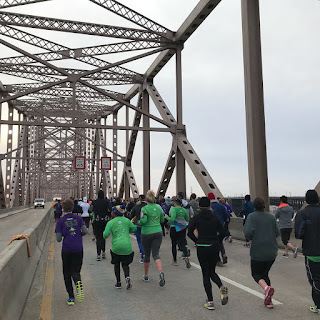 Enthusiastic cheers of spectators welcomed us back to the Missouri side of the course, with runners doing the 7k ramping off of the bridge to the right and to their finish line. Despite clear signage along the course directing traffic, some 7k runners got confused and kept running with us! 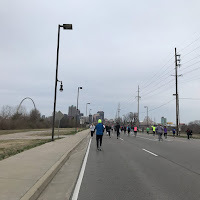 We headed south along Broadway, reaching the mile 5 mark just past the I-64 overpass and Busch Stadium, home of the St. Louis Cardinals. We continued on south, as our surroundings became more drab, especially to our left, as we passed by the largely non-residential industrial neighborhood of Kosciusko. To our right was the neighborhood of Soulard, one of the oldest communities in the city, and home to the North American headquarters of Anheuser-Busch. A group of fun spectators out cheering us on in the cold provided us some snocaps - an old fashioned, small dark chocolate disc shaped cookie sprinkled with small white candy balls on top. Somewhere near the Anheuser-Busch headquarters, I ran into Pam from Mississippi, who I met at Eddie and Natalie's house the night before, and we would run together from miles 6 to 9.5, taking us all the way around Soulard and over the confusing interchange of the I-44 and I-55 highways, before following the perimeter of the 29.95-acre Lafayette Park. The nicely restored homes in the charming neighborhood of Lafayette Square surrounded the park, an area I've been through during both half marathons I've run in this city. 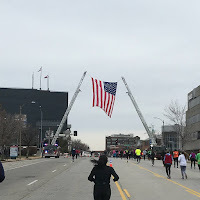 We began to run due north along Jefferson Avenue, taking us over the railroad tracks and I-64 before I split off from Pam underneath a massive American flag, as the half marathoners continued on straight up the avenue to run the remaining 5K to the finish. Marathoners turned left onto Market Street, and with the crowd thinning out considerably, we were treated to a nice downhill for a short length of expansive road. Around the 10.5 mile mark, just as we were turning left to head down Compton Avenue, and back over the railroad tracks and I-64, my cellphone buzzes and find out that Hollie was not far behind me, so we meet up and decide to run together for as much of the next several miles as we could. We would end up running the next eight miles together. 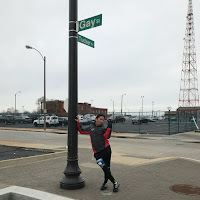 The route then turned onto Chouteau Avenue, an area of St. Louis I was very familiar with, having run along this stretch of road during both of the previous halves I've run. 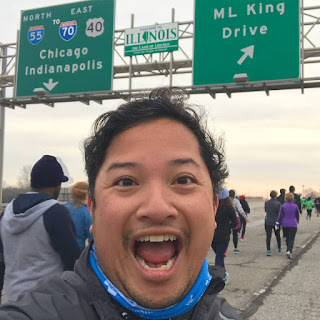 After continuing through a largely industrial part of the course, we found ourselves running over a small overpass over more railroad track, just as faster runners aiming for a 3+ hour finish were coming up the avenue on the other side of the road. Among them was my friend Marc, pacing one of those faster pace groups. 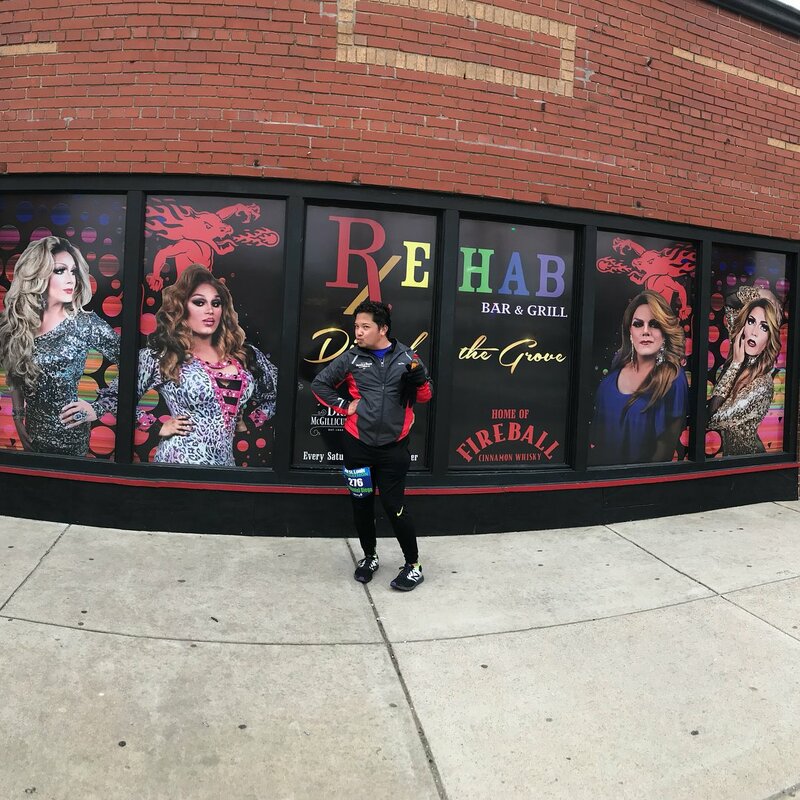 The course then veered left slightly, as we ran through the more commercial Manchester Avenue in the bustling Grove Entertainment District, home to several LGBT friendly businesses, several of which led the initial wave of investment in the area. 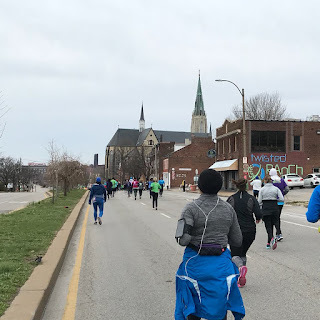 We turned right onto Newstead Avenue, making our way toward Chouteau Park and eventually up toward Clayton Avenue, as we ran past the halfway point of our race, recording a split time of 2:45:32. 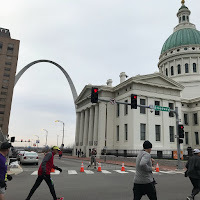 Nearby, we could see the behemoth towers of St. Louis' hospital quarter - passing by the Shriners Hospital, Barnes Jewish Hospital, and the Washington University School of Medicine as we made our way under Kingshighway Boulevard into St. Louis' famous Forest Park. 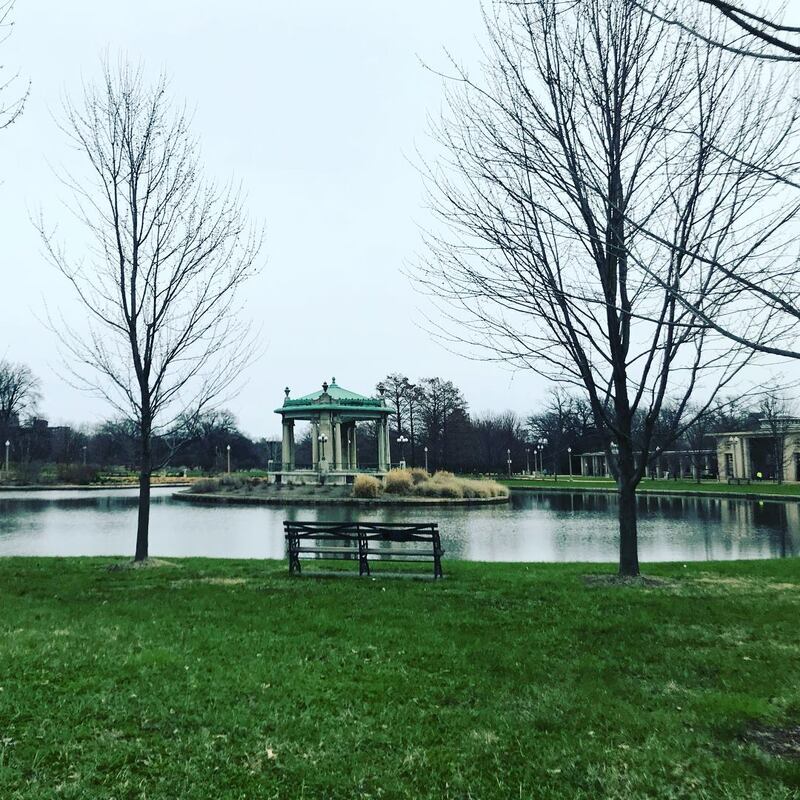 Over the next several miles, we wove through the asphalt roads of Forest Park, considered the "Heart of St. Louis," and was home to several significant events since its opening in 1876 - namely, the 1904 World's Fair and the 1904 Summer Olympics. We first passed by Jefferson Lake along Faulkner Drive, before turning onto Wells Drive, and skirting alongside the Highlands Golf and Tennis Center. We then passed by the Jewel Box, a stately glassed-in art-deco greenhouse that operates as both an event space and horticultural facility on McKinley Drive. 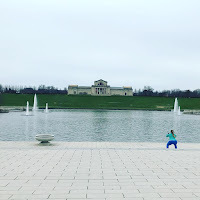 We then followed Union Drive up to a left turn onto Theatre Drive, looping ourselves around Pagoda Circle past the St. Louis Municipal Opera Theatre (better known as the MUNY), an 11,000 seat amphitheatre that totes itself as the oldest and largest outdoor Broadway-style musical theatre in the country. 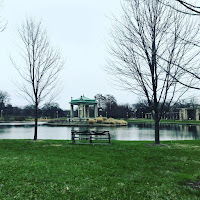 We also ran around Pagoda Circle, encircling Pagoda Lake, with an island at its center that houses the classical-style Nathan Frank Bandstand. With just over 15 miles already logged in, we ran up Cricket Drive, momentarily being misled partway through an adjacent parking lot due to some misplaced barriers. 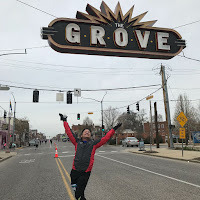 We eventually realized that the course didn't mean to take us through the parking lot, and we turned left onto Grand Drive, seeing the mile 16 marker a little out of place, but where we needed to be. On the other side of the road was another friend Ed and his 5:30 pace group, not too far in front of us. I also happened upon my new friend Lara, who I met at the Two Rivers Marathon a couple weeks prior. After introducing her to Hollie, the three of us would run together for the next couple miles, playing a bit of leapfrog once we felt a little kick in our step. Lara would end up running with me all the way to the finish for the second time in two weeks! 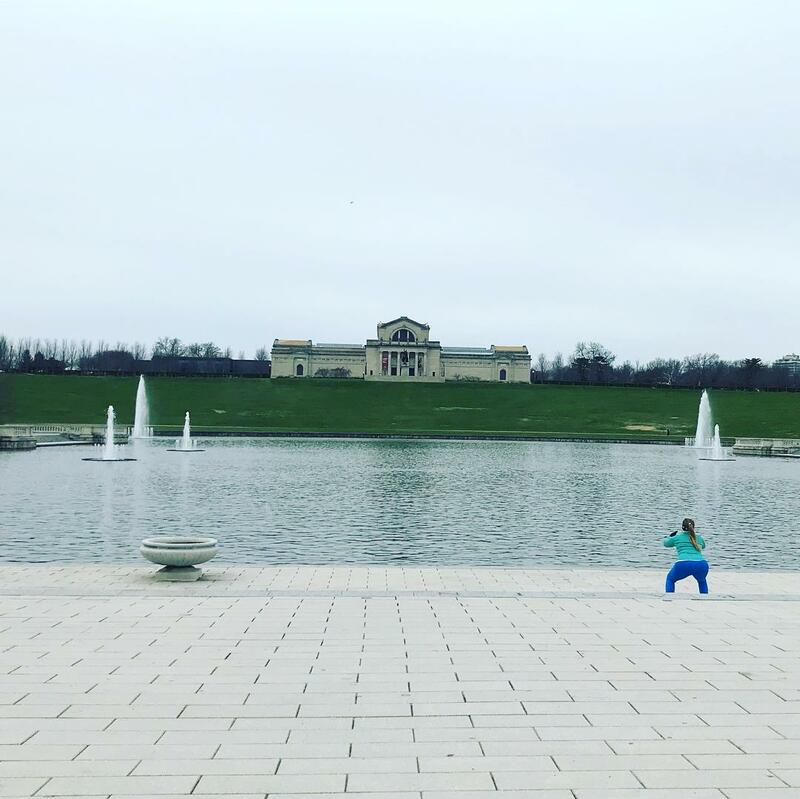 Grand Drive became Lagoon Drive, and at some point along the way (past the Emerson Grand Basin with the St. Louis Art Museum in the background), we finally reached the turnaround, where we would head back in the direction we had just came. Hollie would leave me at mile 18, and I would continue on with Lara along Grand Drive to Jefferson Drive. The course would then retrace our steps from the time we had entered the park near its southeastern entrance. We were now about 18.5 miles into the race, and would retrace the next 4.5 miles along the route that cut through the center of the city, past the hospitals and back over Manchester and Chouteau Avenues, and then through Midtown all the way back to the huge American flag that stood at the corner of Jefferson Avenue and Market Streets. 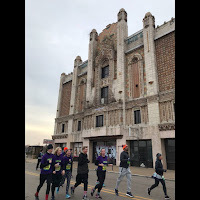 This time, we continued up Jefferson Avenue, along the route the half marathoners were continuing on some 13 miles ago. 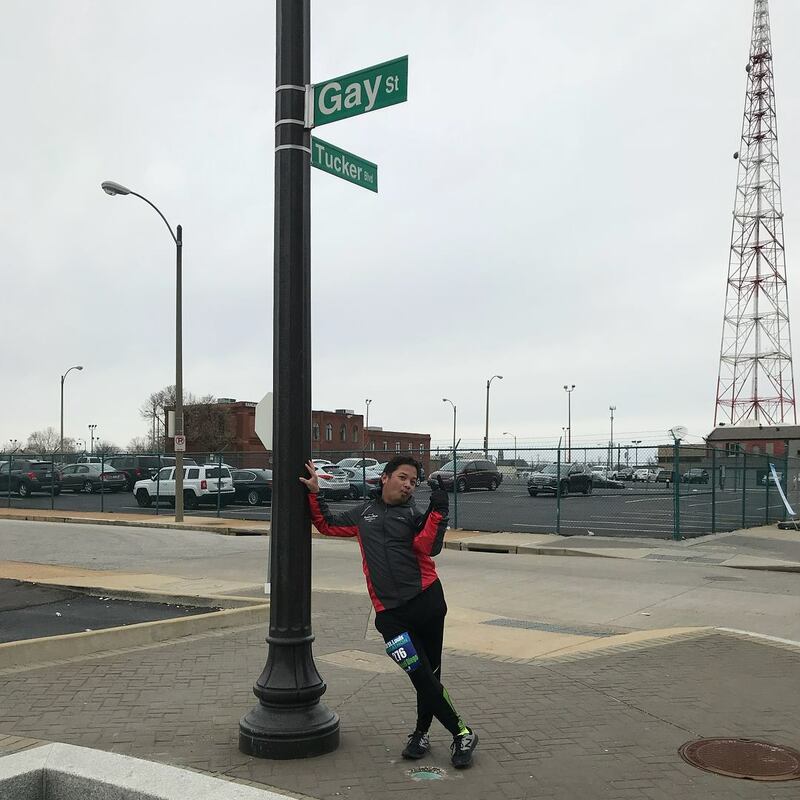 Nearing the end.. and I found Gay St! 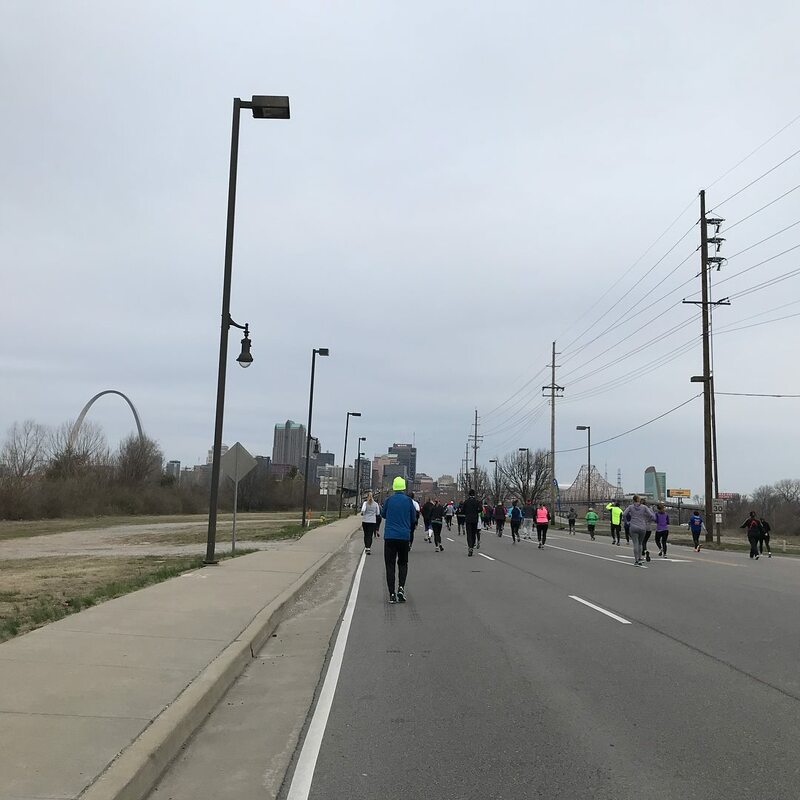 We headed up Jefferson Avenue past the 23 mile mark, then turned onto Washington Avenue as the course cut its way east back toward Downtown St. Louis. My watch read 5:00 as we had 3.1 miles to go. We actually had a nice steady downhill as we came down Washington, playing a little bit of "run two blocks, walk one block" intervals. 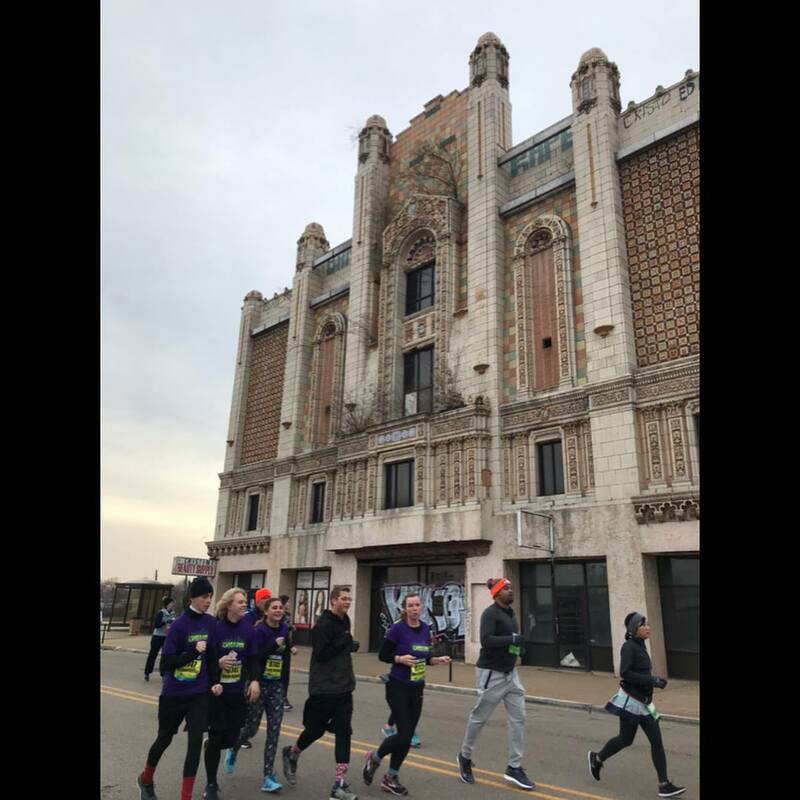 On Tucker Boulevard, we turned left, having reached the 24 mile mark, and followed the route northward as it ran along the border between the Columbus Square and Carr Square neighborhoods. We then turned onto Cass Avenue, as the route then veered back onto the riverfront on Sullivan Boulevard. 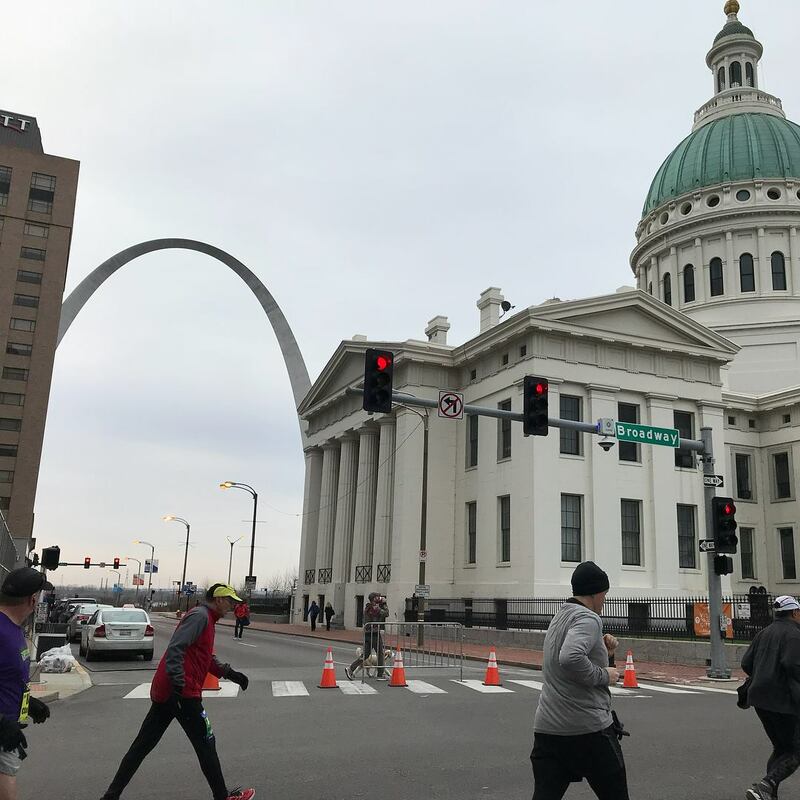 The last mile seemed to take forever as the arch got closer and closer, but as I knew the race would be over just in front of the arch, we pushed as best as we could. 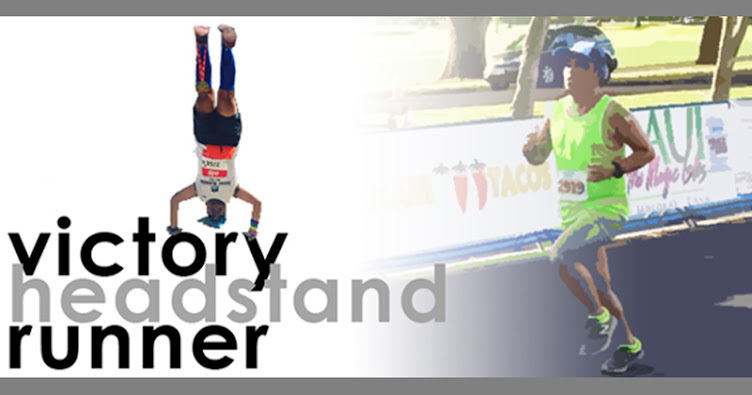 I crossed the finish line in 5:41:25. 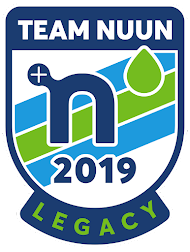 My second half was only ten minutes slower than my first, so despite the less than stellar time, I was pleased with my consistency over running so much distance over the course of the weekend. I had completed 39.3 miles of running for the second time in two weeks! 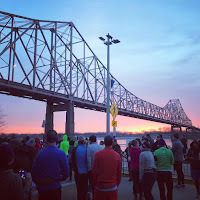 Bling with the Gateway Arch! There to give me my medal was my friend Brigitte, a fellow distance runner and local to the area. 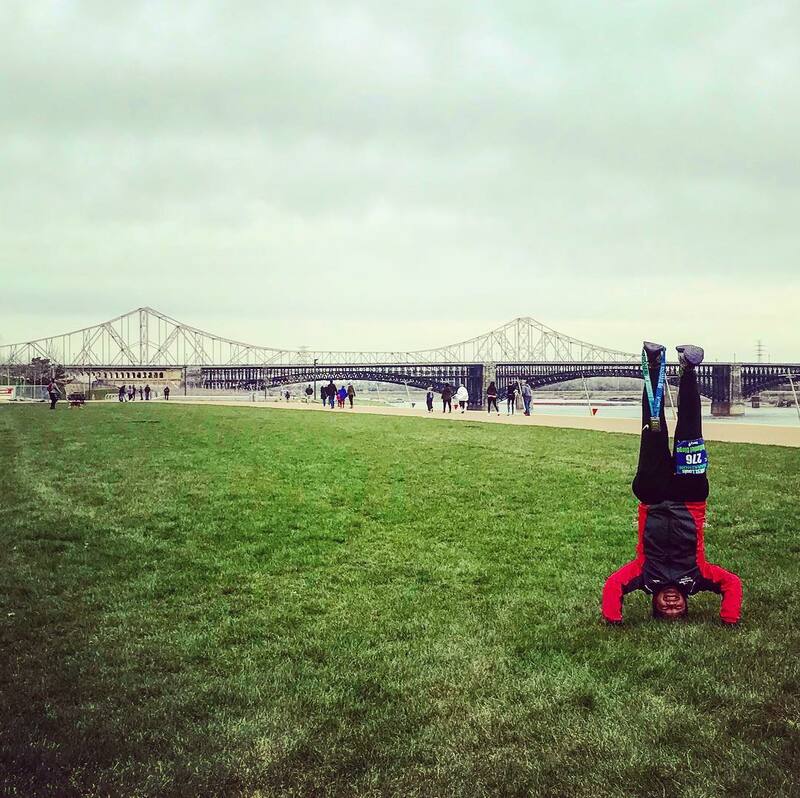 After getting my headstand photo with the bridges we ran across early in the race in the background (already having gotten headstand photos with the arch in the background in my two previous St. Louis races), I headed off to local haunt Bailey's Range, always a must for me when I'm in town. This restaurant has fantastic burgers as well as delicious alcoholic milkshakes! I met up with several friends who had finished the half hours before and were already a few drinks into their afternoon. After spending a good amount of the afternoon with them, we made our way to the airport for our flights home. 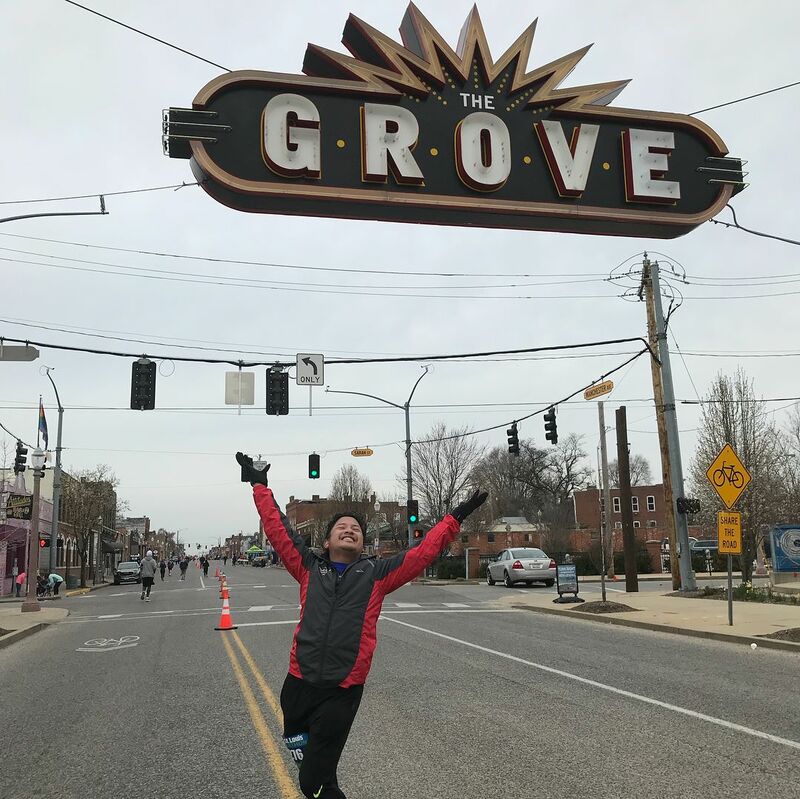 I had finished another 39.3 mile weekend, and I felt good going into the home stretch with three weeks to go before my Revel Mt. Charleston/Big Sur Marathon double!